tions are also strikingly similar, between 4200 and 3600 ybp. A. 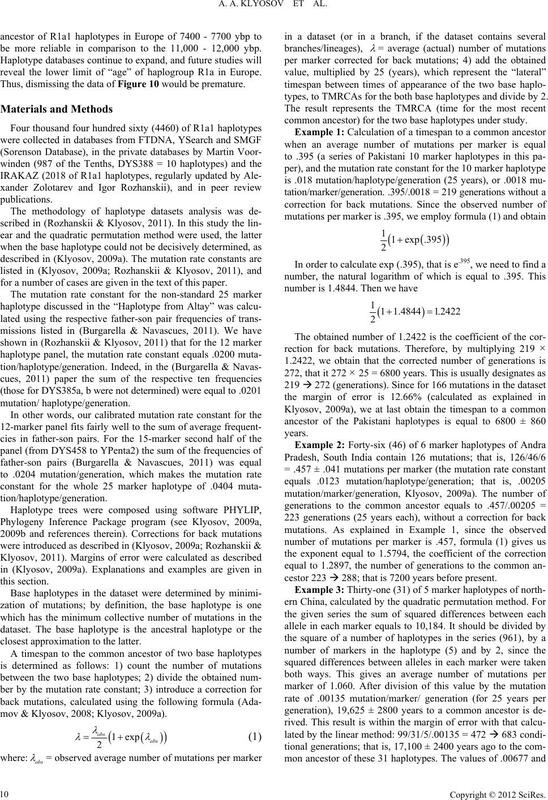 A. KLYOSOV ET AL. migration routes, and their chronology. population [Klyosov, 2009b, 2011b and references therein]). (ybp) bearers of R1b1a2 spoke Indo-European (IE) languages. ero, 2009; Underhill et al., 2009)? later, for example, with the Scythians. The 5-marker haplotype tree for R1a1 haplotypes in Northern China. 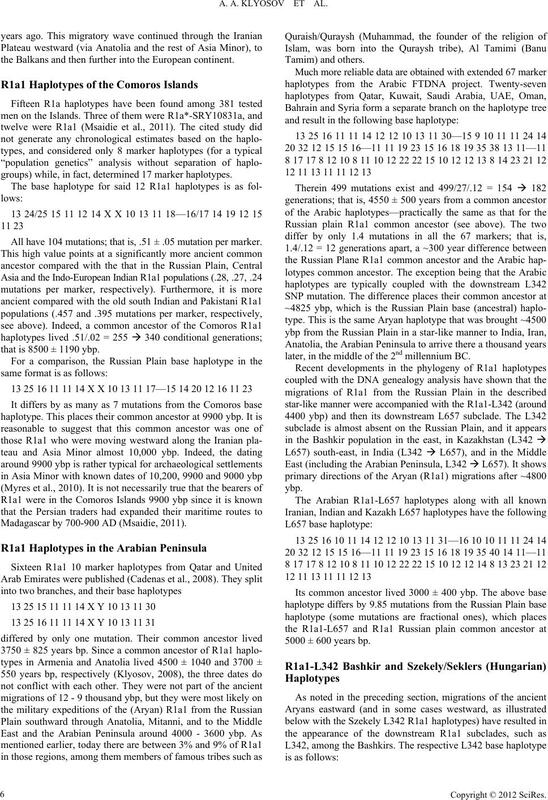 The 31-haplotype tree was composed from data provided by Dr. A.H.
18%, 25%, 32%, and 22%, respectively (ibid). 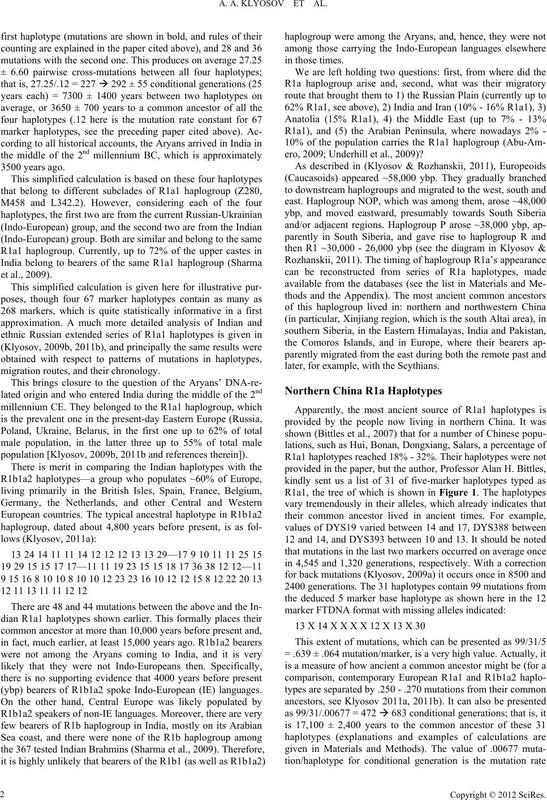 constant for the 5 marker haplotypes (Klyosov, 2009a). quire either a base haplotype or a correction for back mutations. ybp with the territory geographically belonging to Central Asia.  33 generations; that is, 825±320 years to a common ancestor. 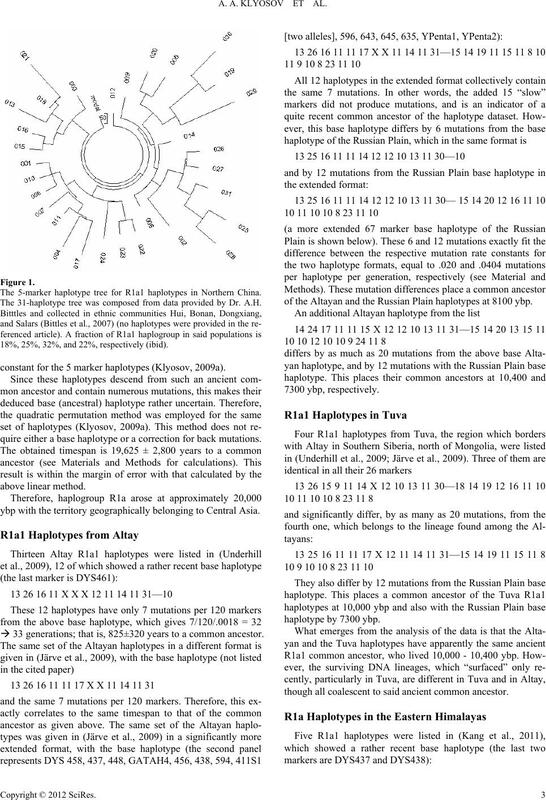 of the Altayan and the Russian Plain haplotypes at 8100 ybp. though all coalescent to said ancient common ancestor. 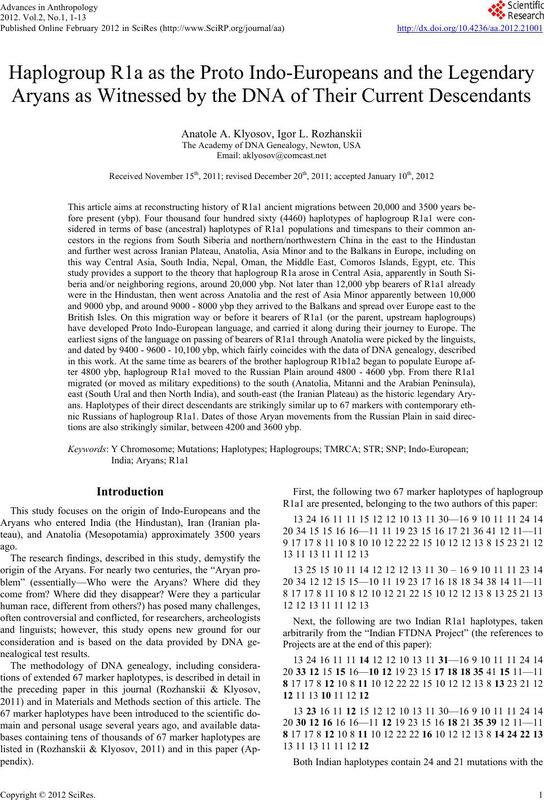 of ancient R1a haplotypes in Eastern Himalayas. around 4050 ybp, depending on a particular haplotype datasets. 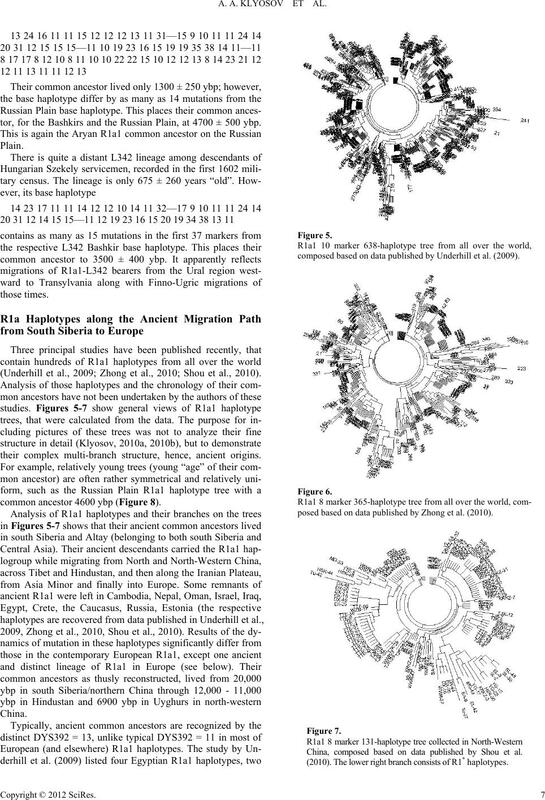 different haplotype datasets (Klyosov, 2009a; Klyosov, 2011b). 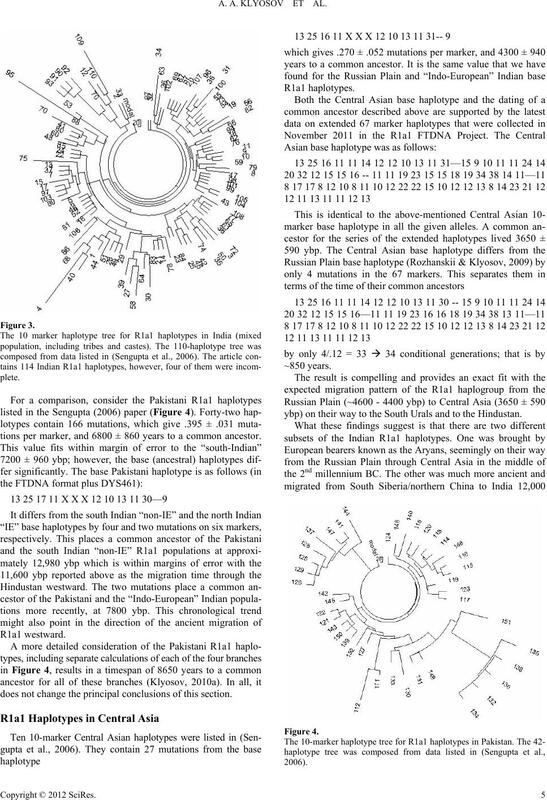 (“Indo-European” R1a1 in India) into 12,000 - 15,000 ybp. hanskii and Klyosov, 2011; Klyosov, 2011b). 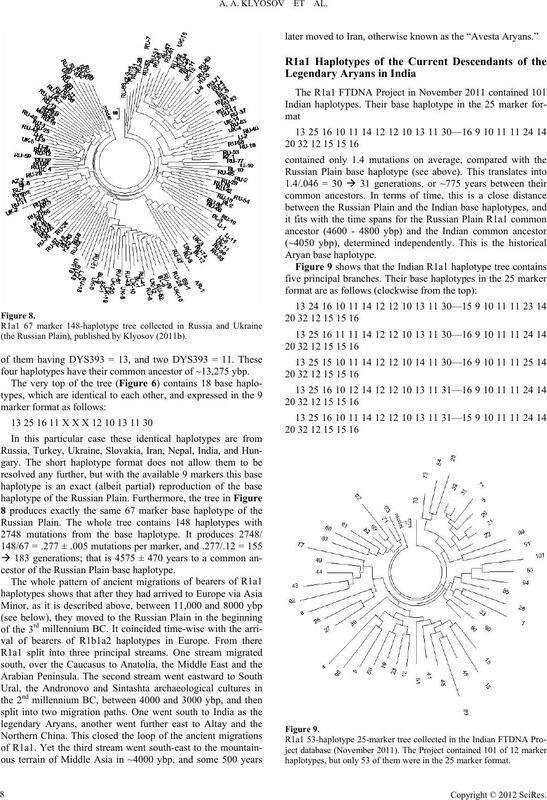 stant equals .0123 mutation/haplotype/generation, Klyosov, 2009a). Materials and Methods for calculations). the passing areas of the R1a1 migration. in their analysis whereby “phantom common ancestors” emerge. 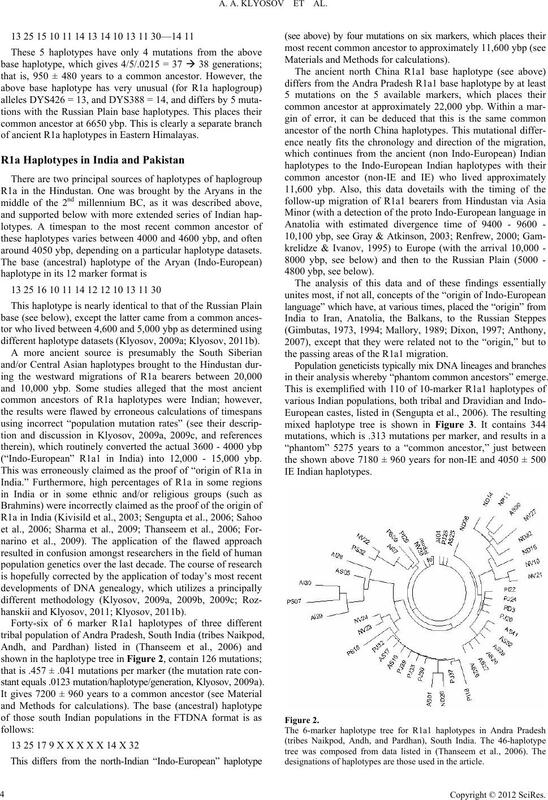 designations of haplotypes are those used in the article. tions per marker, and 6800 ± 860 years to a common ancestor. does not change the principal conclusions of this section. ybp) on their way to the South Urals and to the Hindustan. the Balkans and then further into the European continent. groups) while, in fact, determined 17 marker haplotypes. All have 104 mutations; that is, .51 ± .05 mutation per m a rk e r .
that is 8500 ± 1190 ybp. Madagascar by 700-900 AD (Msaidie, 2011). Tamim) and ot he rs. later, in the middle of the 2nd millennium BC. 5000 ± 600 years bp. tor, for the Bashkirs and the Russian Plain, at 4700 ± 500 ybp. (Underhill et al., 2009; Zhong et al., 2010; Shou et al., 2010). their complex multi-branch structure, hence, ancient origins. common ancestor 4600 ybp (Figure 8). composed based on data published by Underhill et al. (2009). posed based on data published by Z hong et al. (2010). China, composed based on data published by Shou et al. (2010). The lower right branch consists of R1 haplotypes. (the Russian Plain), published by Klyosov (2011b). four haplotypes have their common ancestor of ~13,275 ybp. cestor of the Russian Plain base haplotype. haplotypes, but onl y 53 of them were in the 25 marker format . 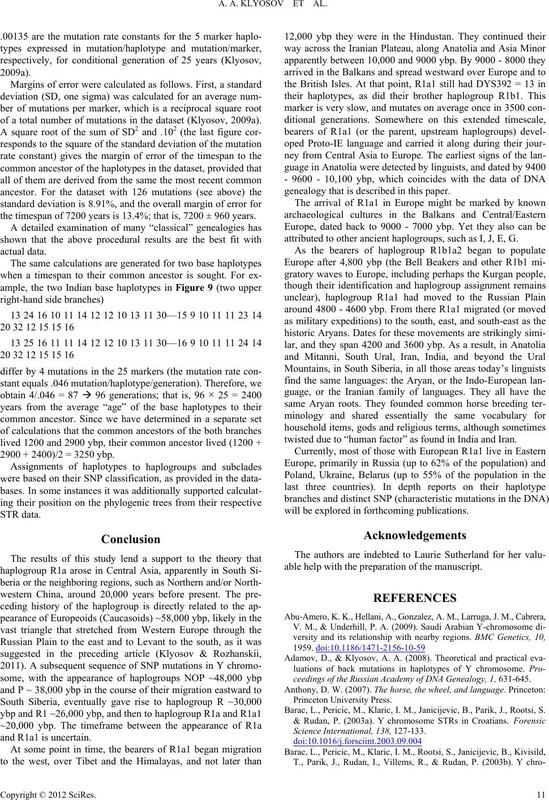 4050 ± 500 years to their ancestral haplotype. type trees can give meaningful results. collective R1a1 common ancestor of 6900 ybp (Kly osov, 2010b). with the majority of European haplotypes. common ancestor lived ~7400 ybp. ely. Their common ancestor lived ~7700 ybp. ns was published (Barac et al., 2003a,b; Pericic et al.., 2005). ns of error compared with extended 67 marker haplotypes. be more reliable in comparison to the 11,000 - 12,000 ybp. reveal the lower limit of “age” of haplogroup R1a in Europe. Thus, dismissing the data of Figure 10 would be premature. for a number of cases are given in the text of this paper. closest approximation to the latter. mov & Klyosov, 2008; Klyosov, 2009a). types, to TMRCAs for the both base haplotypes and divide by 2.
common ancestor) for the two base haplotypes under study. cestor 223  288; that is 7200 years before present. of a total number of mutations in the dataset (Klyosov, 2009a). the timespan of 7200 years is 13.4%; that is, 7200 ± 960 years. 2900 + 2400)/2 = 3250 ybp. 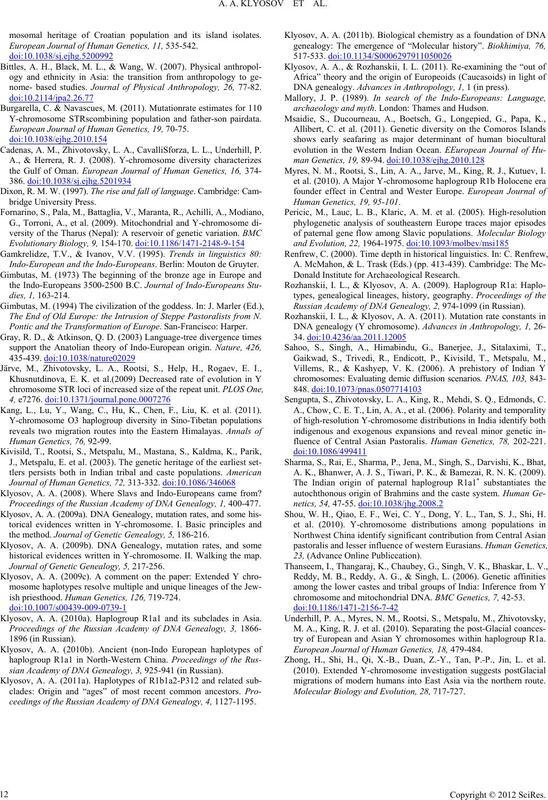 genealogy that is described in this paper. 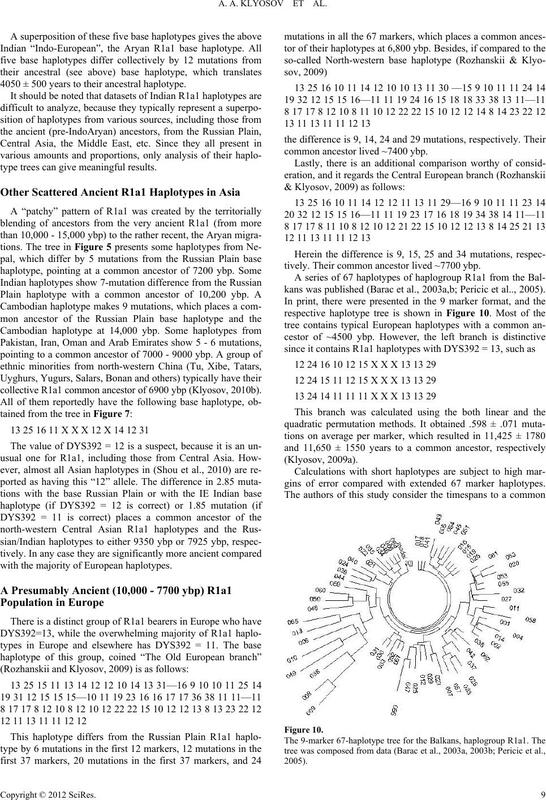 attributed to other ancient haplogroups, such as I, J, E, G.
twisted due to “human factor” as found in India and Iran. will be explored in forthcoming publications. le help with the preparation of the manuscript. B M., Janicijevic, B., P arik, J., Rootsi, S.
ceedings of the Russian Academy o f DNA Genealogy, 1, 631-645.
arac, L., Pericic, M., Klaric, I.
mosomal heritage of Croatian population and its island isolates. European Journal of Human Ge net ics , 11, 535-542.
nome- based studies. Journal of Physical Anthropology, 26, 77-82. Bbining population and father-son pairdata. European Journal of Human Ge net ics , 19, 70-75.
adenas, A. M., Zhivotovsky, L. A., CavalliSforza, L.
Gi urope: the Intrusion of Steppe Pastoralists from N.
Pontic and the Transformation of E urope. San-Francisco: Harper. ang, L., Lu, Y., Wang, C., Hu, K., Chen, F., Liu, K. et al. (2011). J., Metspalu, E. et al. (2003). lyosov, A. A. (2008). Where Slavs and Indo-Europeans came from? the method. Journal of Genetic Genealogy, 5, 186-216.
ish priesthood. Human Genetics, 126, 719-724.
sian Academy of DNA Genealo gy , 3, 925-941 (in Rus si an ). DNA genealogy. Advances in Anthro p ol og y, 1, 1 (in press). saidie, S., Ducourneau, A., Boetsch, G., Longepied, G.
yres, N. M., Roo tsi, S., Lin, A. A., Jarve, M., King, R. J.,M Kutuev, I.
Donald Institute for Archaeological Research. 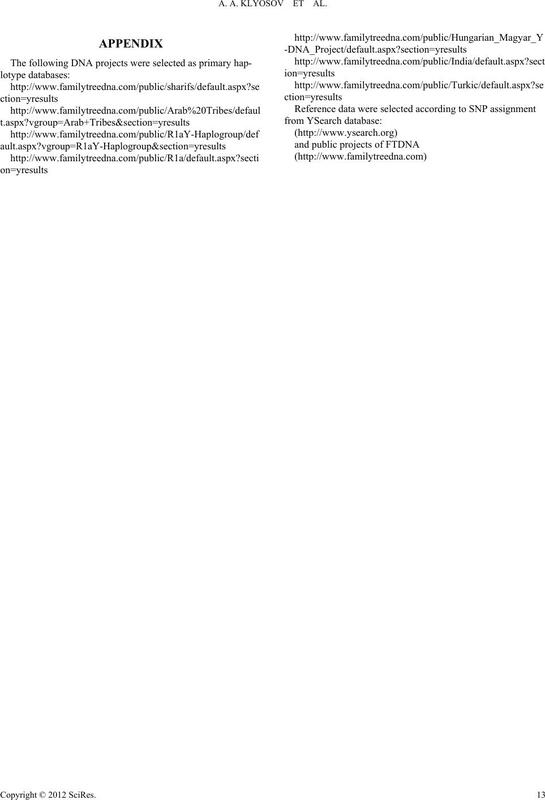 Russian Academy of DNA Genealogy, 2, 974-1099 (in R u ss ia n). engupta, S., Zhivotovsky, L. A., KingS, R., Mehdi, S. Q., Edmonds, C.
fluence of Central Asian Pastoralis. Human Genetics, 78, 202-221. A. K., Bhanwer, A. J. S., Tiwari, P. K., & Bamezai, R. N. K. (2009). hou, W. H., Qiao, E. F., Wei, C. Y., DongS, Y. L., Tan, S. J., Shi, H.
chromosome and mitochondrial DNA. BMC Genetics, 7, 42-53. Z., Jin, L. et al. European Journal of H um an Ge ne ti cs , 18, 479-484.